Armed with a camera, a large bottle of water and comfortable sneakers, EngineerIT tackled the spectacle that was Electra Mining 2018 held at Nasrec Expo Centre from 10 – 14 September. The impression upon arrival was that this was no mere exhibition: it was a must-see showcase of the latest and greatest developments from all spectrums of mining and beyond, encompassing manufacturing automation and electrical technology. Thousands of potential buyers met with hundreds of sellers of leading products, specialised services and the most cutting-edge machinery, equipment and solutions. The event can’t be captured in a single article, but here are some things that piqued our interest. 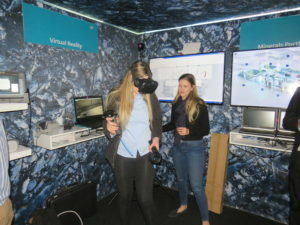 A delegate participates in the virtual reality experience at the Siemens stand. There is a lot more going on than you realise. Exhibitors pulled out all the stops and many stands had presentation rooms, quiet meeting spaces, and interactive demos to really add value to their customer interactions (we won’t talk about the cappuccino machines, popcorn machines, and kegs). Double-storey stands like those of Siemens and Beckhoff Automation meant that visitors could play close attention to the technology on offer. Siemens also had a walk-through tunnel which took visitors through the company’s solutions for end-to-end process automation and instrumentation; as well as its engineering and application software, Comos; and a software platform called XHQ that collects data from a number of sources to give decision makers and management a real-time condensed overview of all information. 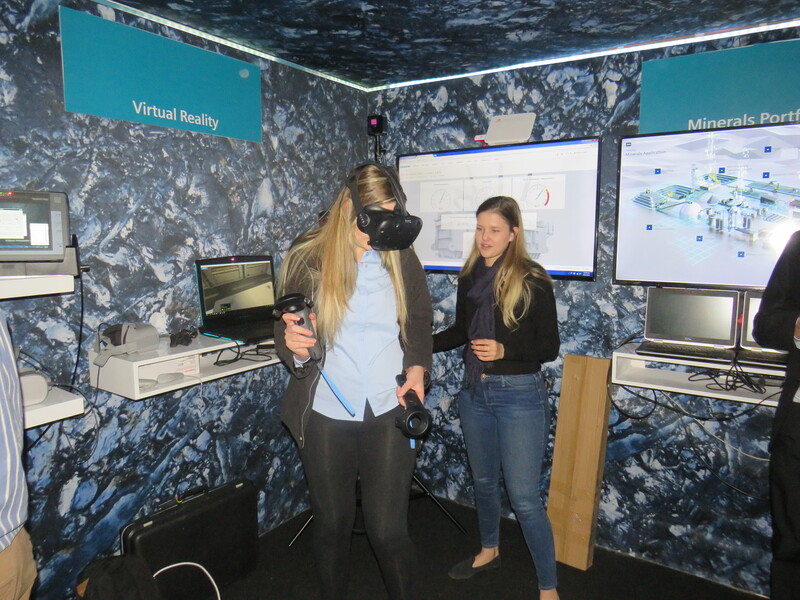 The tunnel ended with a virtual reality experience of Comos. 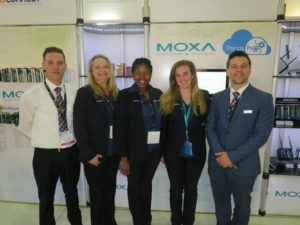 Just a few of the well-informed staff at the RJ Connect stand. There is nothing more disheartening than asking an exhibitor about something on their stand, and to be met with sub-par information. Fortunately, we found that this was not often the case at Electra Mining. 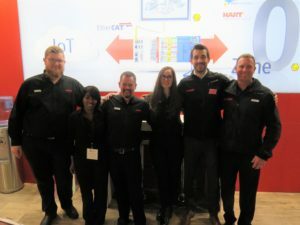 A great example was RJ Connect, which not only had exuberant MD Rob Wright always at hand to educate visitors, but also featured a team of the company’s well-presented and well-informed field application engineers and sales reps. The stand featured Moxa’s ThingsPro software solution which helps handle the complexity of combining information technology and operational technology for industrial IoT applications. ThingsPro provides smart data acquisition, rapid development, and easy management, and is specially designed to accelerate industrial IoT development by simplifying deployment, helping users create a smarter field site. Educated staff (and an endless supply of popcorn) meant that the RJ Connect stand was always a-buzz. The Beckhoff Automation team, ready to discuss innovative control solutions. This may seem obvious given the mining focus, but the necessity of explosion protection and intrinsically safe devices was prevalent on the show floor. Beckhoff Automation emphasised how its barrier-free O/I links are changing the way sensor data can be collected and transmitted in zone zero environments (but you can read more about this in our Q&A with them, coming soon). Pepperl+Fuchs showcased its Zener barriers, which provide cost-saving Ex-protection for various applications in process automation systems. Using these devices, the amount of energy transferred to the hazardous location is limited to a safe level incapable of igniting the explosive atmosphere. The company also ran a competition for an Ex tablet – a very apt and desirable prize in a pool of thousands of mining engineers. While the nine exhibition halls were full of excitement, the presentation sessions certainly cannot be overlooked. The South African Institution of Mechanical Engineering (SAIMechE) hosted free-to-attend presentations every day, and there was a steady focus on skills development. Aubrey Doogan, GM at the SAJ Competency and Training Institute, spoke about reducing unemployment through vocational training including learnerships and apprenticeships, and by providing quality training relevant to the priorities of the National Skills Authority, private and public sector business needs. 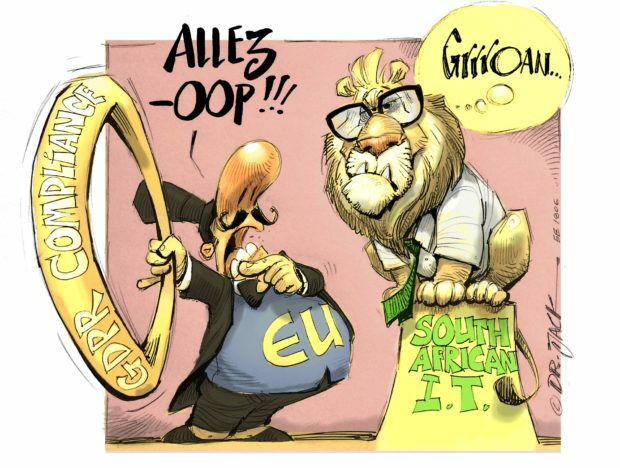 His views were echoed by Rockwell Automation MD, Barry Elliot, who shared his views with EngineerIT, stating that skills development should be a collaboration between government and the private sector, to not only provide opportunities for young people in South Africa, but also to provide local companies with the qualified employees they need for growth and competitiveness (read more about this in our exclusive interview with Elliot, coming soon). Much conversation could be overheard regarding the shortage of adequately-qualified individuals in engineering disciplines. A growing consensus seems to be that engineering concepts should be introduced at primary school level in order for the youth to develop a passion for the relevant subjects, rather than engineering being seen as “just a job”. Electra Mining 2018 was an incredible showcase of engineering innovation, and at a massive scale. With nine halls, over 600 exhibitors and more than 20 000 guests, it’s no wonder (and a pity) that it is only held every two years. We can’t wait to give it another go in 2020.